Our body has an amazing capacity to rid itself of harmful substances! We take in toxins daily through eating natural plant toxins. We are exposed to toxicants (man-made toxins) through eating foods with pesticides residue, breathing in air pollution, and slathering on skin care products. What if you could know which toxins and toxicants are most important to avoid? or which medications will actually work well for you? Our detoxification genes work at different rates due to genetic variations. 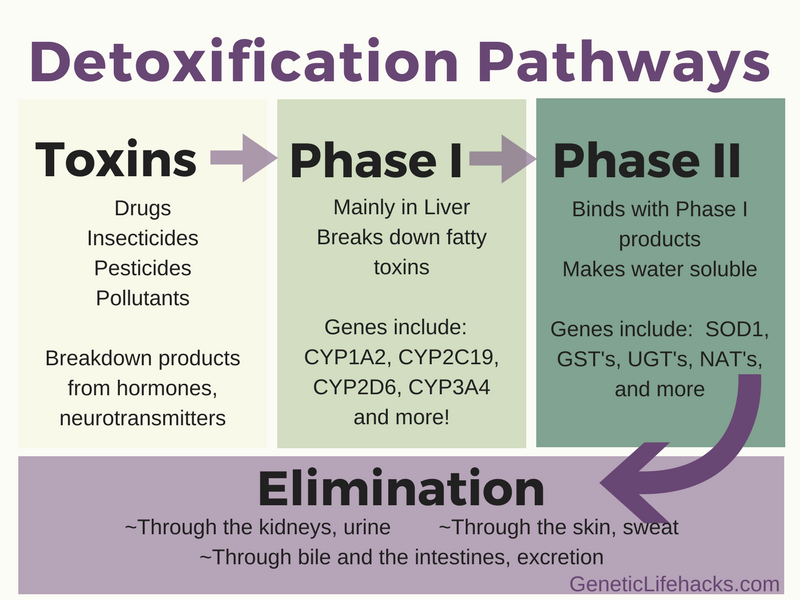 Understanding your own genes for detoxification can help you prioritize which toxicants are the most harmful to you and which drugs to avoid. What are the practical implications here (i.e. why should you care)? too slow and you may build up too much in your body when you take the next dose. Doctors often say “try this medication and see how it works for you”. Knowing how your genes work, you can skip part of the “try this” and know what is more likely to work. 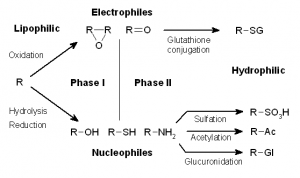 Phase I and Phase II metabolism. Image from Wikimedia Commons. A lot of toxins – whether eaten, breathed, or created in our bodies – are broken down by the Cytochrome P450 family of enzymes in what is known as phase I of detoxification. Most of this takes place in the liver, which is the body’s main organ for detoxification. A simplified explanation…. CYP450 is a group term for the enzymes that take a substance (xenobiotics or endogenous) and breaks it into metabolites, or smaller substances. CYP450 enzymes have iron and oxygen in them, and through a redox reaction can make a drug more polar. Polar molecules are more hydrophilic (likes water) and are able to be eliminated through the kidneys. For each variant that speeds up or slows down drug metabolism, you should read up on any pharmaceutical medications that are broken down by that gene/enzyme. Wikipedia usually has a good list of the ‘substrates’ that are metabolized by that enzyme. Phase II detoxification involves taking the metabolites of phase I and changing them so that they can be excreted. Sometimes the metabolites of phase I are carcinogenic or reactive, so having phase II detox in sync is very important. After a toxin passes through Phase II, it needs to be excreted from the body Some are processed through the kidneys and out through urine, others go through the intestines and out. Bile acids are important in the process, as is proper kidney function. First off, thank you so much for the information. I’ve been looking into detoxing lately and it seems like everyone just keeps pushing ‘mix these ingredients and feel great’, but none of them take the time to actually explain to you why it works. I wasn’t going to do a detox until I understood why it worked. Now I do. Thank you again.